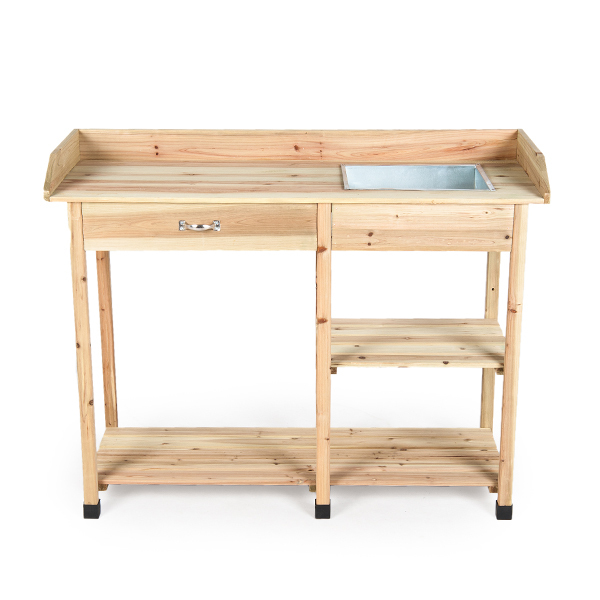 This Ellister Large Wooden Potting Table features a large drawer and a removable inset steel tray. 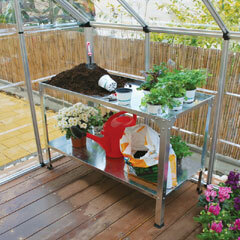 It is ideal for all gardening enthusiasts. Manufactured from high quality fir. 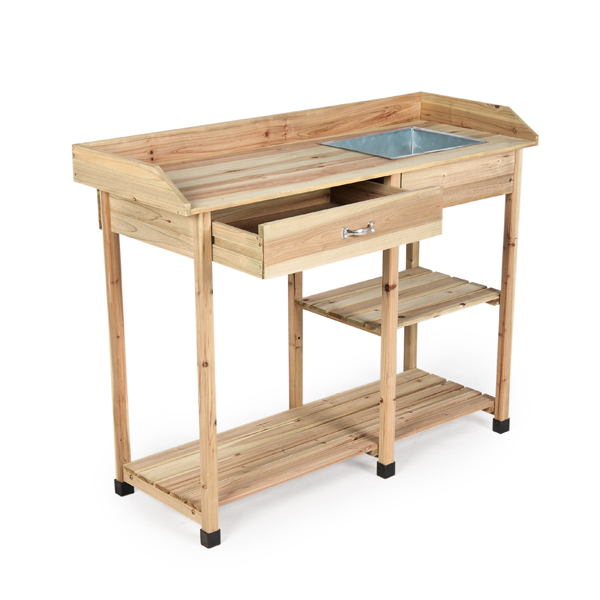 The worktop area is perfect for mixing plant food and getting plants ready for potting - especially with the removable, inset steel tray on the right-hand side. 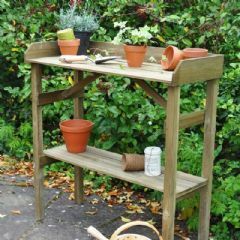 You can store soil and fertiliser as well as empty pots on the bottom shelf and perhaps store your small seedlings and plants on the small middle shelf, this table/ bench area has a host of uses. All this plus a handy drawer for your odds and ends. 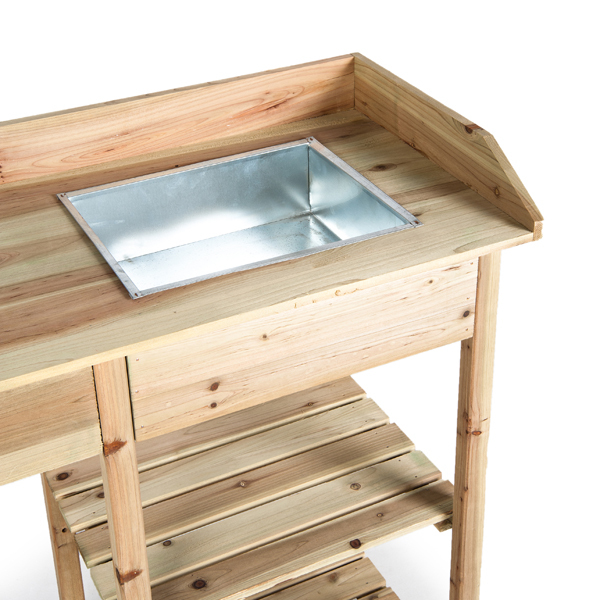 Whilst the instructions took a little deciphering it was easy to put together and when built looks well finished. 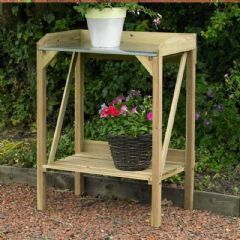 Perfect size and just right for a small garden or greenhouse. Finished product greener than it looks in the picture, however this wasn’t an issue. The wood finish is really good, almost too good to go in the greenhouse. Lovely finish. Decent size and just perfect for potting in the greenhouse. Ordered online delivered very quickly looks good when assembled will use again off you get service like that thanks. 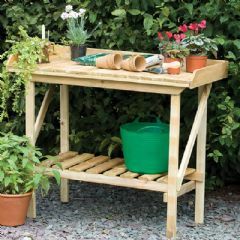 It was good to find a decent sized potting bench and delivery was excellent. 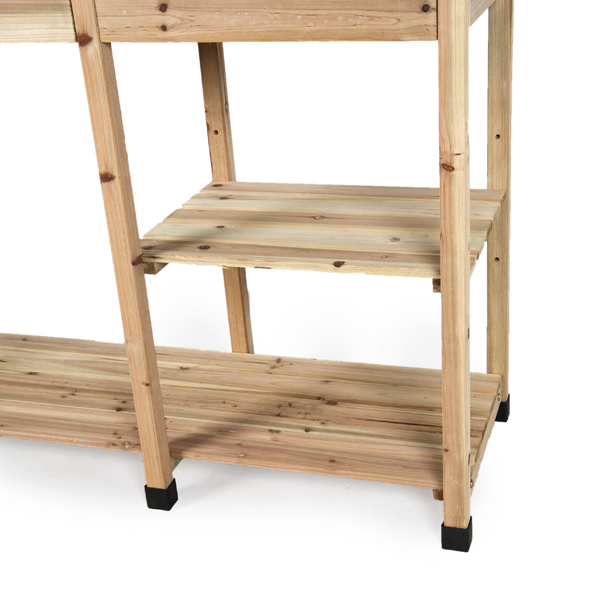 Fairly easy to put together and a good design with plenty of working space and a couple of shelves and a drawer. 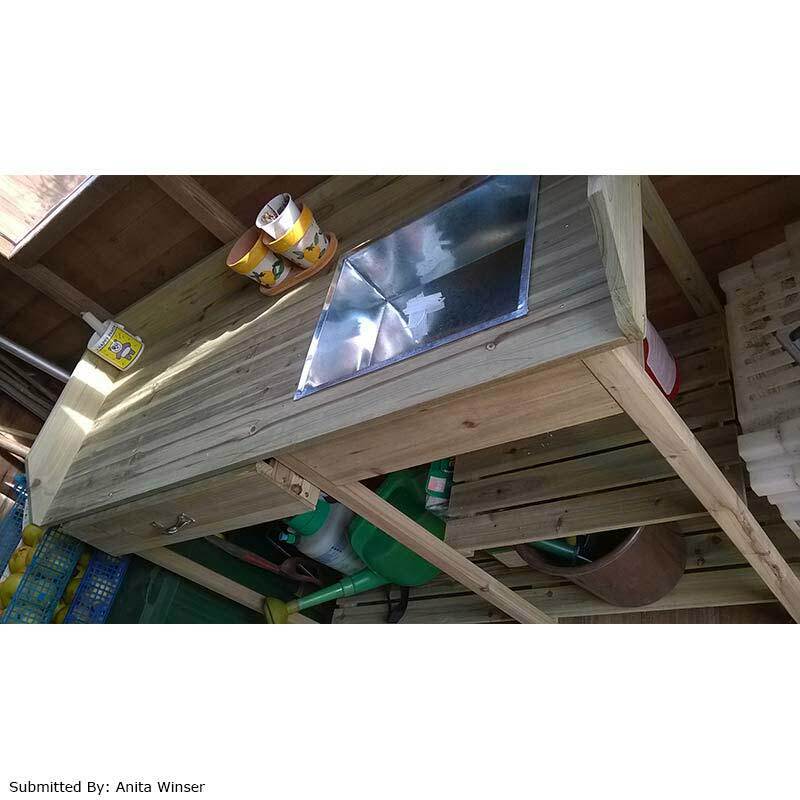 As others have said, the compost tray was a bit bent but it was very esy to fix. Great Value. It was easy to put together even though I am a 76 year old lady. Only needed the help of aged male to hold the legs in place whilst screws were secured. As with other comments I read the metal bowl was dented and not waterproof - shame. Looks great and been put to good use in new potting shed. I love it! It fits perfectly where it was to go, very easy to put together, came very quickly and very well wrapped. 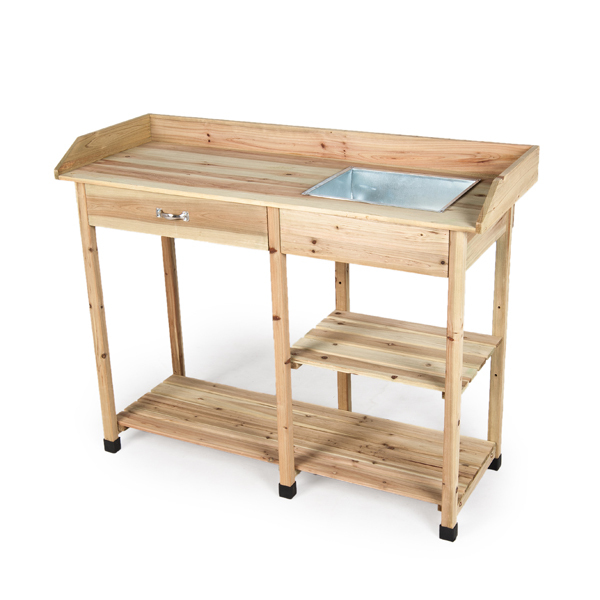 The wood is of very good quality and it is a very well made, sturdy piece of equipment. I would recommend this to anyone. First class. Perfect size, love the shelves and drawer. 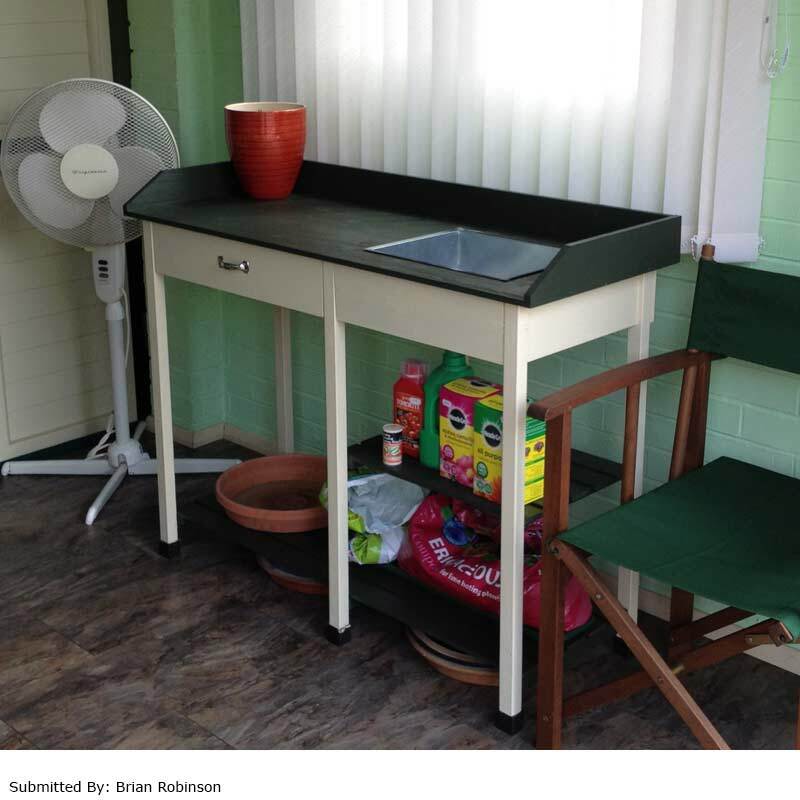 The table itself is a great work station and fits perfectly in my new greenhousr I love it. Instructions to build were a little tricky at first and sadly the tin compost holder was a little damaged when it came. My husband was able to fix that and straighten it. It has been a smashing buy and I can honestly say I use it nearly every day. It’s fab. 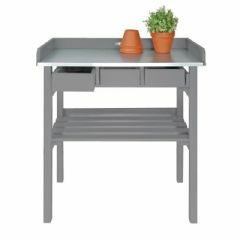 I chose this potting bench on the reviews and am pleased with the result. It is well made, and was quite easy to assemble. Not too many bits. The only problem we had was that one bar had not had two holes drilled, so my other half had to complete that. It would have been OK without, but better with. On the whole it was well finished, and looks good - slightly green colour with the preserver on it. The metal tray had a slight dent, but was relatively easy to straighten out. It's a good size and height, and will be a delight this spring to do potting with!